Edited by bprg, 20 July 2015 - 04:17 PM. I hope it is not just 4 GB of bloatware ! kurapica there is a community edition, OMG! shame on micro$0ft! I don't use free crippled software. I'm still using 2008 due to quick responsiveness in the GUI. the theme colors are not good in my opinion and the lagging kills me. @whoknows: lol. Our company stopped using physical DVDs looong time ago. I can't even remember when was last time I used one at work. Edited by bprg, 21 July 2015 - 03:44 PM. Any one tried Visual Studio 2015 in Windows 7 ? I did and unfortunately I was disappointed. It still conflicts with Zone Alarm when you end a debug session for a 64bit CPU target. I will stick to version 2008 for now. @whoknows: lol. Now you have 30 days to prove you're worth anything to community. If not, you'll be banished! Well, that's a bug in ZoneAlarm, not in VS.
My experience - I installed VS2015 Pro on 64bit Win7 at work. And I can't launch it - installer did create shortcuts in start Menu for Visual Studio Tools, but not for the IDE. Apparently those guys think that Windows 7 is a dead platform and nobody uses them anymore..
Nah, it actually works, you just need to make shortcuts yourself. Or reinstall it. Or something. 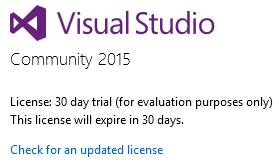 @whoknows: I have installed vs 2013 community abt 4 months ago and I get the 30 day limit dialogue after 30 days. Signining in through this dialogue is a crap as it always welcomes with something like 'service unavailable' error. Edited by tonyweb, 30 July 2015 - 12:05 PM. hmm does it need a crack ? i heard it doesnt work with static keys ? Professional & Enterprise edition needed key for activation, The keys works. Edited by bprg, 11 August 2015 - 04:23 AM.